When performing ultrasound examinations of the heart, several measurements are done in order to determine how healthy the heart is. One of these measurements is left ventricular ejection fraction, which measures the pumping efficiency of the heart. In order to calculate the ejection fraction, we need to calculate the volume of the heart chamber. To do this, clinicians have to acquire images from two perpendicular angles, also knownn as views, of the heart, and then manually draw the heart chamber wall on the images. This can be time-consuming, and is also subject to large interobserver variability, meaning that two different doctors may draw the heart chamber wall quite differently, thereby resulting in different volume measurements. An inexperienced user may not even know were to draw the heart wall, an automatic tool may in the future enable these users to perform necessary measurements. At the Centre for Innovative Ultrasound Solutions (CIUS), we are working on completely automating ultrasound heart measurements using deep learning. 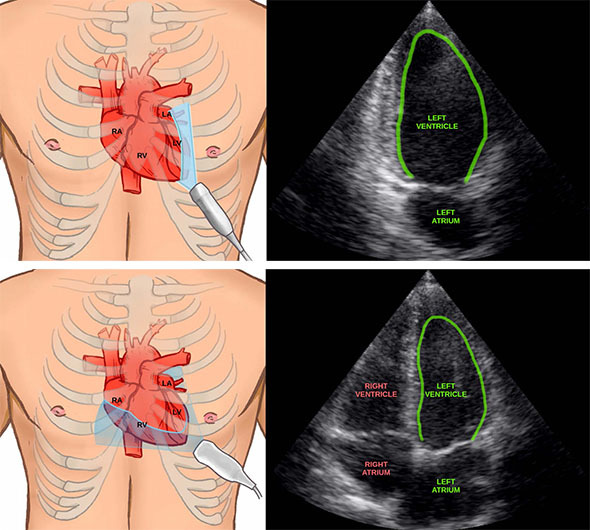 Two ultrasound images acquired at different angles of the heart with the left ventricle wall drawn in green. Illustrations by Helene Mørk (www.helemork.com). View classification: Learns to identify which images are of the different angles/views of the heart. Left ventricle segmentation: Learns to draw the heart chamber wall. The neural network result of finding the heart walls, identifying the different views, and when the chamber is largest and smallest. Does it work in real-life? Together with clinician Ivar Mjåland Salte at the Sørlandet Hospital in Kristiansand, we performed a study to see how well our methods can do these measurements automatically compared to manually drawing the heart wall contour. Ultrasound recordings of 72 patients was collected and manually annotated. The neural network was able to automatically and quite accurately calculate ejection fraction for all patients, even for patients with low image quality ultrasound images. 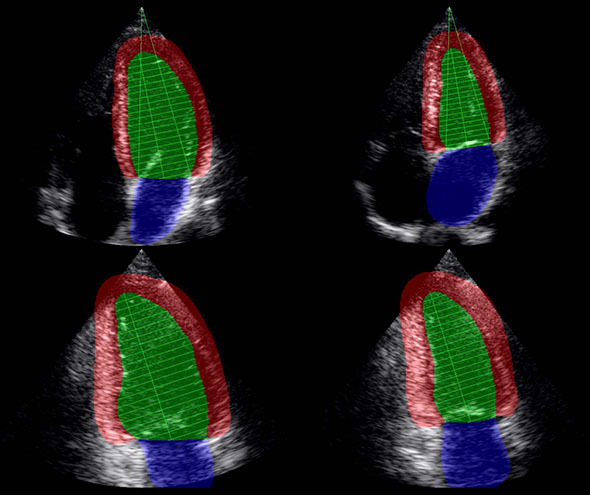 Ejection fraction is only one of many clinical measurements of the heart, we are currently working on extending the neural networks to learn several other measurements, such as MAPSE, LV mass and strain. An inexperienced user may not know where to place and how to angle the ultrasound probe correctly. This is necessary to get valid measurements of the heart. At CIUS, we are also developing an artificial intelligent assistant which can guide inexperienced users to acquire correct ultrasound images of the heart. Datadeling fra HUNT bidrar til gjennombrudd i diabetesforskning.